We have positioned ourselves in the midst of the most renowned suppliers of lockstitch sewing machine, in the global market. We offer lockstitch machine both in hand and foot operations. We provide our superior quality lockstitsch machines at affordable prices. Our Sewing Machinery Line is the oldest - now 70 year old. 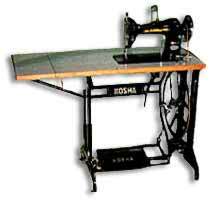 We offer the cheapest & most economy models in Domestic & Industrial Sewing Machinery. Available in Hand & Foot Operation for Home Use Machines. Motorised Version for all Industrial high speed Machine.